While content and language form a certain unity in the original, like a fruit and its skin, the language of the translation envelops its content like a royal robe with ample folds. For it signifies a more exalted language than its own and thus remains unsuited to its content, overpowering and alien. for the past few days i’ve been doing research at the cca, as part of a month’s long grant. already living in montreal becomes an constant bilingual challenge, but working at the cca brings the task of translation to another level. with italian, brazilian, spanish, mexican, and french (and one ecuadorian!) scholars doing research in the same place, our conversations constantly switch from language to language. politeness often makes us change language with the arrival of a new colleague—often at the expense of the flow of conversation. it is, of course, extremely fun and stimulating, but it foregrounds the bumps and wrinkles that translation involves, not only between languages, but also between disciplines and even research schools. por eso me puse a pensar en un post sobre la traducción, porque hasta cierto punto es algo en lo que tengo que pensar constantemente, porque mi idioma materno es el español, pero ahora vivo en estados unidos y debo hablar y pensar en inglés constantemente. resulta extraño también por eso estar ahora en montreal, porque de repente la gente asume que mi idioma natal es el inglés, y no es así! before coming to the states to do a phd, i was teaching architecture courses in ecuador. because the institution where i was working had a relatively small library, i was forced to translate many of the texts that i wanted my students to read. so translating became a part of my teaching routine, and actually a very helpful exercise in order to review the texts. at the same time, i started footnoting my translations—at first for the sake of accuracy, but soon in a conversation of sorts with my students, leaving hints and comments of possible relations to other texts we had read. i’ve also had to fill in as impromptu translator at public events (after a couple of hours of translating, i would start translating backwards, talking to spanish-speakers in english and viceversa). previous to that, my first trip to europe provided an unexpected shock: for the first time, i did not speak the language of the place! this, plus the suspicion that eventually i would do a phd (which i’m doing now), made me start learning additional languages—and further thinking about translation. por supuesto, lo mas entretenido de la traducción es lo que no se puede traducir—por ejemplo, resulta un ejercicio muy interesante tratar de traducir el tono pretencioso de un autor, o la elegancia de otro. cuando traduzco del inglés al español, la cosa es distinta, y trato (como lo aconsejaba benjamin) de traducir palabras mas que oraciones, es decir, de no sacrificar el ritmo del español por lograr una traducción más fluída. pero famosos errores de traducción han llevado a continentes enteros a errores de interpretación notables. 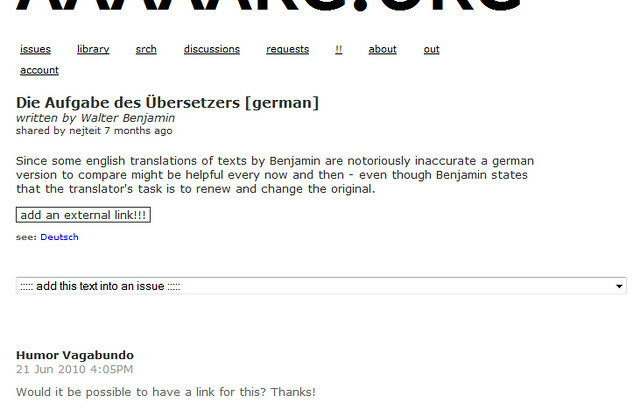 architecture-related texts have had unexpected twists involving translation. there is for example the famous mistranslation of tafuri, turning a convoluted writer into nearly unintelligible. more interesting than the mistranslation to me is the framing that was done of both tafuri and rossi in the us academia of the late 70s and early 80s (read eisenman), which turned rossi into an unwilling poster child for autonomy, and tafuri into a defender of negative criticality a la adorno, something he (dark and gloomy as he might have been) never strongly advocated (refering to negation only as the lesser of evils, and in his earlier days even arguing instead for an architecture based on the study of production relations via benjamin). on the other hand, the prescient early translation of modern architecture: a critical history by kenneth frampton, published almost simultaneously in english and spanish, made the book popular in many spanish-speaking architecture schools, probably with the extra push given by the fact that the critical regionalism argument seemed to validate projects more focused on identity and materials and less dependent on big budgets. adicionalmente, el famoso error, admitido en la traducción al inglés, del fatto urbano de rossi como “urban artifact” ciertamente no facilitó la comprensión del concepto, mucho más fácil de entender como ”hecho urbano” en español. finalmente, many of these authors were translated in a more liberal way by marina waisman, argentinian architecture historian extraordinaire, a quien he estado leyendo ultimamente. sadly, in her later book, “el interior de la historia,” waisman seems to basically synthetize (eso si, con mucha habilidad) the arguments of several well-known theoriticians, and the actual new content of the book might have been reduced to a dense essay rather than a prolongued reiteration of ideas. pero, dado el pobre estado de la historiografia sudamericana, waisman’s constant argument synopsis was probably justified: most of the texts she mentioned were probably not available to her readers, y al reiterar los argumentos de tafuri, barthes, foucault, frampton, rowe, et al, waisman was able to juggle the translation of their arguments to the south american context, which she did do with great skill. ps. la imagen, una ironía de la vida… keine liebe für walter! pps. i should say i’m re-reading waisman, since she was my introduction to architectural historiography on my first year of university back in ecuador! it’s weird to realize how much she (and the professor that assigned her, fantastic jose guerra at ucsg) influenced my views. Walter Benjamin, “The Task of the Translator”, in Illuminations, trans. Harry Zohn, London, Fontana, 1992 pp. 70-82.